Our range of brown decking is just what you need if you're looking to add a modern feel and look to your outdoor space while paying homage to a traditional wood setting. These warm composite deck boards are made through the combination of natural hardwood and a polymer resin, resulting in a robust and long-lasting flooring product. By combining a contemporary appearance with a classic timber feel, our brown decking is a must-have for any stylish space. To create a truly stunning outdoor space, there is really no need to look further than our collection of brown decking! A sleek and sturdy flooring option, able to fit into any modern design with the added benefit of practically zero maintenance requirements. To see how our composite deck boards can be used to create the outdoor living space of your dreams, watch our showcase video here. Due to its state-of-the-art design, our brown decking requires no upkeep requirements at all! 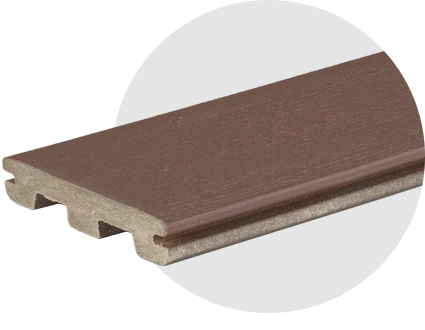 The perfect substitute to plastic and natural wood decking, our brown composite decking will never splinter or rot, with no need for painting, sealing or staining! Created using natural hardwood and polymer resin, our range of brown decking is incredibly strong and hard-wearing, guaranteed to last no matter the conditions. As a result, you never have to be concerned about staining and fading ruining your dream deck! 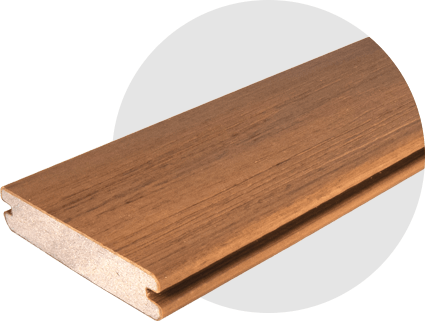 Each of our brown decking boards comes with a 30-year warranty, manufactured with the finest materials, your deck is guaranteed to not splinter, rot or decay for three whole decades! Available in a number of different styles, our collection of brown decking boards are suitable for various tastes and designs. The texture of our brown deck boards' surface also varies between flat wood grain, linear wood grain and grained capped with a full polymer sleeve. The board itself is available in two options: a non-capped wood polymer composite or fully capped composite for an easy-clean surface. The way in which you would like your brown decking fastened will determine the style of board that you purchase. Styles available in both grooved and ungrooved. In order to meet your decking expectation, ensure you choose the right board style.